Escape the urban bustle at Laguna de Guatavita and Mina de Sal de Nemocon. Get some cultural insight at Gold Museum (Museo del Oro) and Catedral Diocesana. Get out of town with these interesting Bogota side-trips: Zipaquira (Catedral de Sal, Plaza de los Comuneros, & more). There's still lots to do: take in the awesome beauty at Mount Monserrate, admire the masterpieces at Museo Botero del Banco de la Republica, examine the collection at Casa de Moneda - Coleccion Numismatica del Banco de la Republica, and take in the architecture and atmosphere at La Catedral Primada. For other places to visit, where to stay, photos, and tourist information, you can read our Bogota route builder site . Recife, Brazil to Bogota is an approximately 9.5-hour flight. The time zone changes from Brasilia Time (BRT) to Colombia Time (COT), which is usually a -2 hour difference. While traveling from Recife, expect slightly colder days and colder nights in Bogota, ranging from highs of 22°C to lows of 9°C. 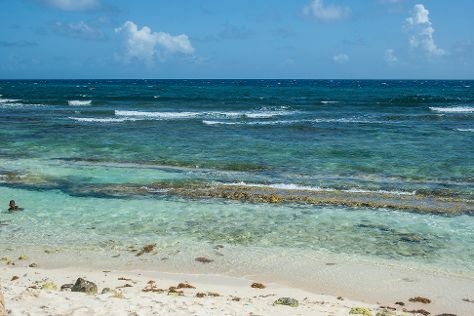 Cap off your sightseeing on the 21st (Wed) early enough to travel to San Andres Island. Get in touch with nature at West View and Playa de Spratt Bight. Get a sense of the local culture at Primera Iglesia Bautista and Island House Museum. There's much more to do: identify plant and animal life at La Piscinita, step off the mainland to explore Johnny Cay, discover the deep blue sea with a scuba or snorkeling tour, and stroll through Playa de San Luis. To see maps, where to stay, traveler tips, and tourist information, read our San Andres Island trip itinerary planning app . Traveling by flight from Bogota to San Andres Island takes 2.5 hours. Plan for much hotter temperatures traveling from Bogota in August, with highs in San Andres Island at 36°C and lows at 30°C. Finish your sightseeing early on the 25th (Sun) so you can travel to Cartagena. Castillo San Felipe de Barajas and Templo de Santo Domingo will appeal to history buffs. You'll discover tucked-away gems like Aviario Nacional de Colombia and Centro de Convenciones Cartagena de Indias. Take a break from Cartagena with a short trip to Playa Blanca in Isla Baru, about 1h 05 min away. There's still lots to do: contemplate the long history of Walled City of Cartagena, gain insight at Plaza Santo Domingo, take in the spiritual surroundings of Convent of Santa Cruz de la Popa, and indulge in some culinary diversions at a local gastronomic tour. To see photos, traveler tips, and other tourist information, use the Cartagena trip maker tool . Traveling by flight from San Andres Island to Cartagena takes 3.5 hours. In August in Cartagena, expect temperatures between 38°C during the day and 30°C at night. Finish your sightseeing early on the 29th (Thu) so you can travel back home.